Zaryusu is a lizardman of the Green Claw Tribe and the younger brother of Shasryu Shasha. He is the wielder of Frost Pain, one of the four treasures within the lizardmen tribe. 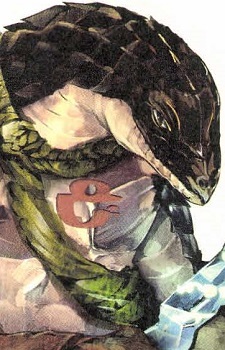 He is seen as one of the strongest lizardman alive, his strength even able to impress Cocytus. Zaryusu became a traveler, leaving his village to see the outside world. He is motivated by his determination, resolve and sense of duty to his tribe. When the tribe was threatened by the undead army, he showed that fighting alone is futile and convinced the the tribes that the only way to survive is to form an alliance with the other tribes. He later falls in love with Crusch Lulu. Zaryusu killed Iguva=41, but was killed by Cocytus in a later battle. Due to a deal between Ainz and Crusch, he was brought back to life.